And then we dunked in your face. Yesterday, a colleague headed to GameStop to buy NBA 2K13 for Xbox 360, and I should have been right behind him. As a big hoops fan, some virtual Knicks action seemed like a sure thing facing what should be a rainy weekend in New Jersey. What stopped me? The $59.99 asking price, so I settled for the next best thing, that being NBA 2K13 for iOS and Android, which is currently running up and down the hardwood at a more reasonable $7.99; free up some space, because it's 1.09GB. The verdict: not bad, so long as you go in with low expectations. 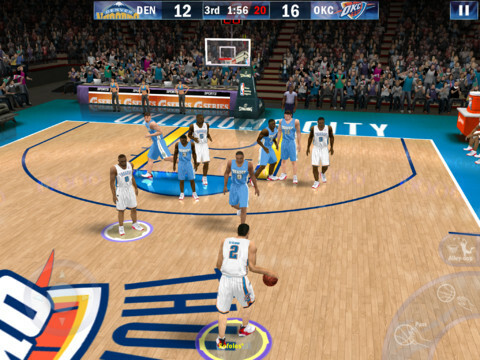 Know this: the smartphone and tablet NBA 2K13 is a pint-sized version of its console counterpart. Don't head into this expecting a feature-packed basketball game, complete with a franchise mode or even All-Star festivities. Calling it barebones would be an understatement, with Quick Game, Multiseason and Practice modes, along with a Greatest Games option where you attempt to recreate some of the finest moments in pro basketball history, like Kobe Bryant scoring 48 points in a playoff game against the Kings, and Michael Jordan dropping 63 on the Celtics. Cool feature, but there are just five challenges to complete. You'll have to wait for the rest in future updates. As for performance, quite the mixed bag. The game, for whatever reason, insists upon showing cut scenes of players hanging out and waving their arms around between baskets, and you cannot shut this off in the Options menu. 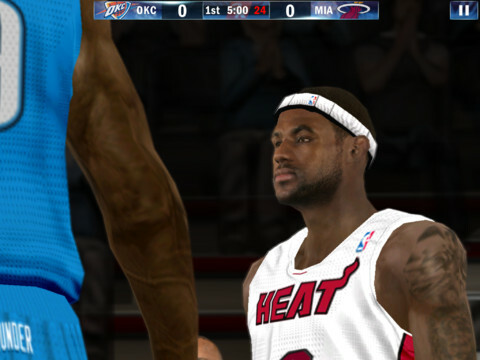 What's more, bodies appear blocky, and player faces are among the worst we've seen in a basketball game since the 90s. Carmelo Anthony looks cross-eyed, while other dudes could pass for mutants in some first-person shooter. Get used to that, because NBA 2K13 does its best to pepper these cut scenes throughout games, most likely to load a bunch of stuff behind the scenes to prevent vomiting polygons. Moves? Where we're going, we don't need moves. Crossover dribble? Nope. Spin on command? Nah. Behind the back pass? Have you been paying attention? 2K Sports kept things basic, which means you can block shots, steal, pass, shoot and throw alley-oops. Not exactly the most expansive list, but considering all the X's and O's this game has to process, with 10 animated players and hundreds of fans going crazy, perhaps this is for the best. Thus far, I've painted a pretty drab picture, yes? Well here's the thing. 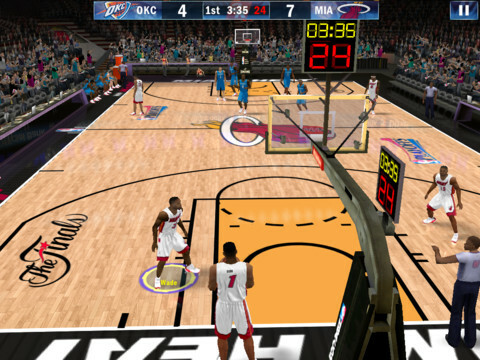 NBA 2K13, despite its warts, is still a cool basketball game. The performance issues need tweaking, but it does an admirable job of recreating five-on-five, which runs surprisingly well for the most part. You'll see the occasional backcourt violation from pushing the ball handler across the mid-court line, and the net animations blow (the rims might as well have no nets), but the action will definitely ratchet up the adrenaline levels, as you throw outlet passes to wide open guys on the fast break, who then proceed to throw down the rock. Also, it appears that 2K Sports dumbed down the difficulty just a bit for the mobile crowd, so draining threes is a lot easier. Ultimately, you walk away more satisfied by the overall pace, since games result in 75-70 final scores, instead of 40-36 on the console side. What of the controls? You have two completely different set-ups. The default scheme, by far the best, provides a virtual analog stick on the left, with buttons to shoot/pass/jump on the right. The other, one-finger, lets you control the game by poking players to pass and shoot. Decent, but it simply lacks that added layer of control most basketball fanatics crave. The developers also deserve a nod for the presentation. Menus are easy to navigate, commentary (while limited) remains constant during games and the music perfectly fits the mood. Finally, there's multiplayer over Game Center or Bluetooth, but we've yet to try this out, due to a lack of competition. 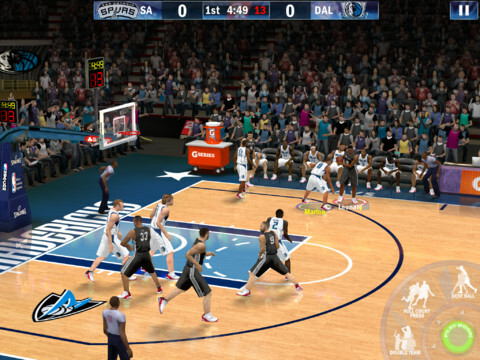 NBA 2K13 may be a sloppy mess at times, but it's still one of the more enjoyable basketball games for smartphones and tablets, one that'll presumably get better well into the season as 2K Sports tinkers behind the scenes, as it should. The price is steep compared to other iOS/Android titles, but if you're on the fence about forking over $59.99, the handheld edition is a solid alternative. What's Hot: Fun up-tempo basketball, default controls work best, solid presentation with music and commentary, easily navigable menus, Greatest Games mode, Practice mode. What's Not: Hideous player faces, awkward bodies, too many cut scenes between plays, conspicuous lack of modes, one touch controls don't work so well, not enough moves, 1.09GB makes it a chunky download.